@Heidelberg | Get Your Grub On! It was my last evening in Heidelberg before moving on and a good old friend took her time to have dinner with me before I left. We met at ‘Thanner’ on Bergheimer Strasse which is named after a famous tv commissar and which was only 10 seconds walking distance from my hotel. 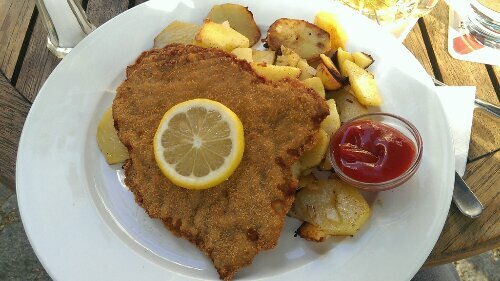 I ordered the ‘Wiener Schnitzel‘ (vienna schnitzel), a crispy breaded veal escalope that was super thin and all the fat had been rinsed off before. 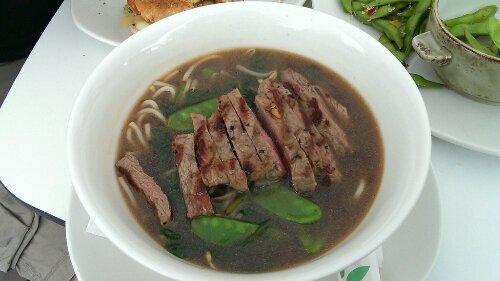 It tasted great and crunchy and a nice squeeze of lemon gave it an extra twist. 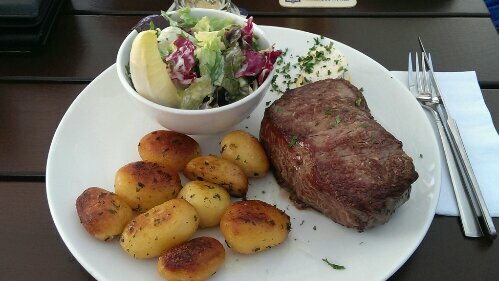 The roasted potatoes were chopped chunky and panfried in butter together with some white onions and were a great side to the schnitzel. ‘Thanner’ is a lively casual place which colleagues and I visit quite frequently for drinks when in Heidelberg. I hardly tried their food so far but the schnitzel was so tasty that I might change that during future visits. The waiting team is super friendly too and so I surely come back when I have meetings here.